Fez is my champagne and white kitty girl. She was born in the ancient UNESCO world heritage site of the medina in the imperial Moroccan city of Fez. I brought her to live with me in Panama, while I work my new job at a new school. When you bring in an animal to Panama they undergo a quarantine period of 40 days where you promise to keep them inside and away from any other animals, in case they are carrying some sickness. YOU agree to this, the animal does not. Fez got out Saturday night onto the porch of the house, which I have screened the access door to, so that she can’t go there. She found a way. Sunday morning I found her inside (how did she get back in? ), in an unnatural sleeping position (not sleeping) on the other bed in another bedroom. I knew instantly that something was wrong. She was listless, groggy and groaned in protest when I picked her up. She also had cat pee on her fur – ????? Who peed on her, and why would she have LET them??? I thought she possibly might have eaten one of the half-dead cockroach bugs that I had found lying on their backs, feebly kicking on the floor. These were victims of some insecticide the landowner had used before my arrival – I am careful about poisons, since I have cats. I have lost some to this problem before. So, before 6:30 am, I am on my way by foot and bus to the center of Panama City to a vet. The first bus said no as I was climbing aboard with the cat carrier, but the second bus agreed to transport her and me. I texted a friend who I knew lived where there was a vet, and she got me directions and a phone number. The vet said, once I got there (took my very last five dollars for the taxi), that she appeared to be OK, and most probably would not die (thanks, doc), 35 dollars, please. My credit card declined. Fortunately, my friend arrived with cash, and she let me borrow 40 bucks till payday. Fez, the cause of this trauma, slept all the way home, letting out an ear-splitting yowl occasionally, to be sure all of us on the bus were awake. Such fun. It was not until I got home after 1 pm that I found the evidence of what happened. On the front porch, I had a five gallon bucket of ornamental flower cuttings that I wanted to root. The flower shrubs in the planter bed were skimpy looking, so pruning them made them appear thicker, and if I could root them, I could fill in the thin spots. Half the cuttings were scattered around the porch, and the leaves were eaten off of them. And the clincher? There were puddles of cat pee everywhere. she is still a little hung over. I am just glad it has not killed her – so far……. 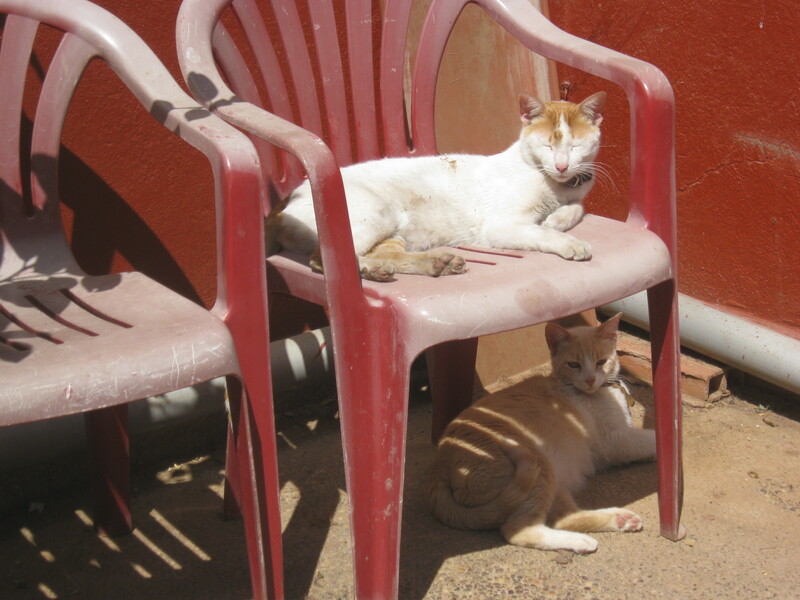 This entry was posted in Cats, Panama and tagged bus, cat, Fez, flowers, money, pee, sick, vet. Bookmark the permalink.